This is a great counting book and it’s also fun because as the hunter (who never seems to be able to see the animals that are hiding from him) is looking for the animals, your little reader will have fun trying to guess which animals are hiding in the background. The best part is the end when the hunter finally sees the animals and they are all following him. 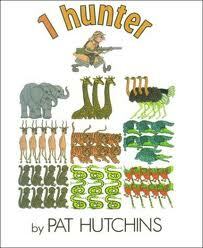 Again, great for counting…”1 hunter”, “2 elephants”, “3 giraffes”, etc. but fun and interactive as well. Mouse from the If You Give a Mouse books is decorating his Christmas tree. This book is great for the babies, toddlers and preschoolers in your life. 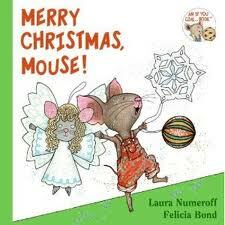 It’s a board book that let’s your little ones count the ornaments as Mouse puts them on his tree. They will likely love the surprise ending, too. An adorable counting and rhyming book that is the perfect match for the Halloween season. and her little batties five. We flap! squeak the five. 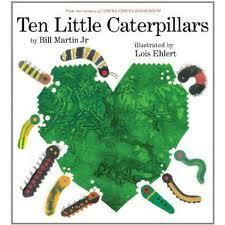 Ten Little Caterpillars by Bill Martin, Jr.
Love, love, love this book! It’s colorful, it involves counting and numbers, it rhymes…there is so much in this book for so many ages. I love that this book isn’t “just” a counting book and it isn’t “just” a book that rhymes. It’s also a science book that very young children all the way through early elementary school children could use to learn more about caterpillars, what the caterpillars eat, what animals eat caterpillars and different types of butterflies. When children are ready to start exploring the shapes of letters and numbers, Wikki Stix are a super fun way for children to practice, especially if Wikki Stix are new to them. 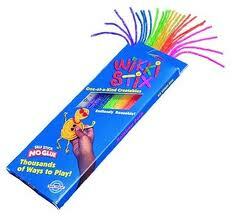 Wikki Stix are essentially wax covered yarn that you can bend and stick into whatever shape you’d like which is why they are great for practicing letter and number shapes. Some kids may be able to figure out how to manipulate the Wikki Stix into letter and number shapes without having an example to follow. Others, however, may need the shape to follow either just to look at as a model or they may need to have an example that they can place their Wikki Stix on top of to follow. Then, when they are done practicing their letters and numbers, they can use them to make whatever they want. For older kids, they can be used to practice sight words. 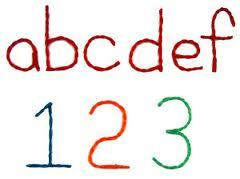 They can also be used to practice writing their name or family members’ names. This book is perfect for the toddler/preschooler in your life. It has animals, it rhymes and it has counting. 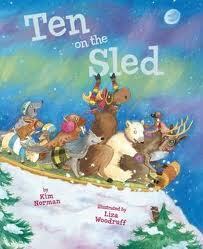 Each animal in the book tells their mom or dad a certain number of kisses they need before they can go to sleep. Then a little girl asks for 100 kisses, one for each curl and a boy tells his mom he wants a million kisses. How many kisses do you think your child will ask for? 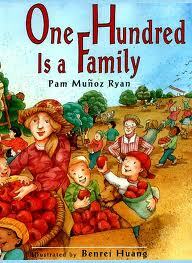 This book is a counting book as well as a book about families. The beautiful illustrations depict families of various shapes and sizes working together. As the numbers get larger (the books starts counting by tens after a while and goes up to 100) the author introduces the idea of neighborhoods, schools and teams being “families” working together towards a common goal. A great way to talk about communities and families and how even though they aren’t the same they do have some similarities. A collection of Arctic animals….10 caribou crunching, 9 muskoxen munching, 8 ravens raving…you get the idea. The clever twist on this book is that on the first page with the caribou it’s not snowing at all, but as the countdown continues, it starts snowing more and more. By the time you get to 1 moose, silent in the falling snow, it’s practically a blizzard. This would be a great book for practicing counting backwards and also talking to your children about how animals use camouflage….it’s awfully hard to see 2 snowy owls swooping when there’s snow all over the place. You can try to read this, but you will end up singing like I did. 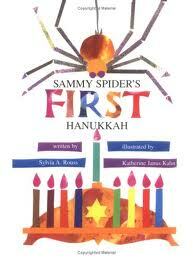 Sammy Spider warms his feet by the menorah’s candles each night as he watches Josh and his family eat yummy foods and listens to them sing songs during Hanukkah. Sammy Spider is a little jealous of the dreidels and wants one for himself, but his mother reminds him that “Spiders don’t spin dreidels. Spiders spin webs”. (This part repeats several times and is fun for kids because they catch on and will “read” along with you when you get to that part of the story.) In the end, Sammy Spider’s mom surprises him with a gift that helps Sammy Spider forget about how disappointed he was that he didn’t get to have a dreidel of his own.